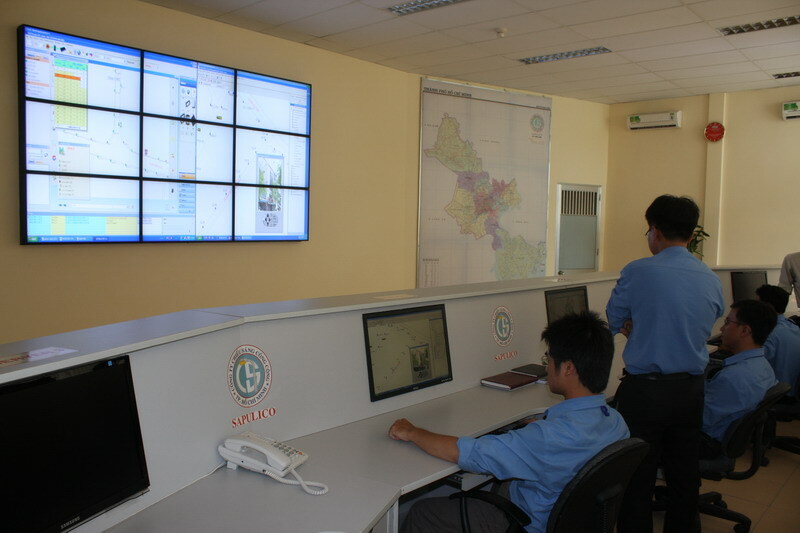 With technical solutions - technology on the Ho Chi Minh City will have a central control system, said modern public lighting condition wherever, get the information of the system in order to establish how organization to deal effectively with incidents, problems. In the field of public lighting, as well as in other fields, managed entirely thanks to accurate information, timely and complete. - At the center is formed including a computer network connecting the local network is responsible for the control, control and management to step outside the center spotlight at all times when performing system functions control. Local network at the center are connected to each partition control management of existing lighting system via the Internet transmission. At each partition control existing lighting system formed the control structure include: 1 closet partition areas for regional ITD; ITD is used in Internet transmission lines using ADSL technology with receiving functions, controlled from the center moved to the address of a local control unit (abbreviated as UCL) and receive information about the transfer of UCL center. UCL has received orders from the cabinet function area to transmit commands to the control unit lights (abbreviated UDC) and noted the information forwarded by the UDC control cabinet area. Information transmission system in the region using transmission lines existing lighting, using communication technologies PLC (Power Line Carrier - Use electric wave 50Hz as communication carrier). Between the UCL are connected with each other through electrical connections from the unit (referred to as DCM) or wireless connection unit (abbreviated UTR). (DCM for those who can pull lighting lines adjacent to each other, UTR for places where cable can not drag borders mesh together). The system proposed above is the only system in the world helps to know exactly the status of public lighting of each light point at any time. In addition to the direct economic benefits gained by energy savings, savings in maintenance management, ... central control system increases the quality management services and public lighting systems. This is especially important due to current trends in the world of public lighting has become an indicator of the quality of urban life, especially in tropical countries where the nightlife is considered in. This image is also part of the city (such as: "Paris - City of Light") and attracted tourists. Public lighting is poor, leading to a virtual standstill in tourism due to security reasons. Flexible lighting, creating entertainment venues for night life make charms of the city, increasing the value and wealth for the town. Feeling this relatively new development in the world more and more. The era of communications, television and travel facilities enables people know other cities, to have a comparison and higher requirements for their city. Most residential areas were identified and launched the program light. More generally the central control system is the public lighting management means better management to control lighting systems to achieve the goal is to provide quality lighting at the highest level with the lowest price possible. Investment efficiency expressed through technical efficiency, management effectiveness and economic efficiency. The technical solution chosen above will bring a new technical standards in the field of public lighting in Vietnam: illuminated remote and remote operations. Standard techniques are based on networked take data from devices of lighting systems for the Centre and the Centre can run to every highlight of the system. A new technique used in this project is the transmission of information on low voltage lighting network with different carrier frequencies. This will not save the information cabling, installation not dig roads. Center noted, information processing (eg through photocell, real time, regional weather forecasts, events and festivals taking place in the area). Then the command control center system (to each lamp, each control panel area) as open off mode, reduction mode. Simultaneously Center always collecting technical data to check the operation status of the system and give the alarm if a problem occurs. The application of this new technology will help the system operate effectively on the basis of the information collected and the action made quickly and accurately. Quick calculation: The system operates as efficiently if the crawl speed and the speed of response action as quickly. In the control network, the information gathered in the lighting system and control takes place with electricity transmission rate. For example, today if a route was trouble off the morning or at night to take some time to have information about the Company at the public lighting from surveillance patrols, from the maintenance team, from the people repair Gaza's new start (not including the accuracy of information, quality of information ...). With new technology, the center will be alarm through the network and the power off at the control cabinet lighting will start immediately within a few minutes. Then the repair will be carried out immediately, so quickly that people can not recognize. Also we are actively repairing the equipment group was almost nowhere on the basis of aggregate statistics from the device profile. Management of each individual object. Manage the exact amount of power consumption for comparison with electricity bill of Electricity. The report irregular or regular for unscheduled repairs, the maintenance plan, manage data be updated or manage supplies inventory. Especially so accurately manage the lifespan of each device to have a reasonable strategy and effectiveness. - Due to the flexible control of illuminance on demand should reduce light pollution in many natural environments. - In addition, thanks to the control of lamp brightness, power consumption reduces energy radiating portion surrounding environment causing the greenhouse effect.